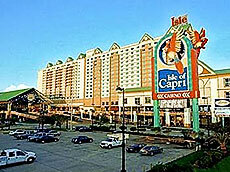 Originally known as the Isle of Capri, the Isle Casino Hotel Biloxi was the first casino to open along the Gulf Coast in 1992 when the dockside gaming legislation was passed in the state of Mississippi. The Isle remains a convenient stop for tourists and travelers with its close proximity to both Mobile and New Orleans. Situated at the foot of the Biloxi-Ocean Springs Bridge on the Biloxi side, the Isle Casino Hotel houses more than 700 rooms, with standard rooms offering a choice of a king bed or two queen beds, free wireless Internet and local calls, cable TV and more. Guests also have the option of balcony or water view rooms, as well as junior suites and executive level rooms. Golf and spa packages are also available. If your family consists of picky eaters, don't fret. The Isle Casino Hotel has something to satisfy any appetite. Calypso's Buffet is the ultimate dining experience at the Isle. From savory entrees and crab legs served nightly to delicious desserts, Calypso's will make sure you leave with a full stomach! For a flavorful dinner, try Farraddays' Restaurant, where specialties such as the slow-roasted herb-crusted prime rib or the blackened red snapper top the extensive menu. If time is a factor, drop in to the Tradewinds Marketplace and take your pick of Pizza Hut Express, Hershey's Ice Cream, The Deli and more quick dining options. And when you're ready to unwind, kick back at the Lava Bar, enjoy a drink and listen to some great live music. The choices don't stop there. The casino floor is a whirlwind of more than 1,300 slots and 31 table games. Try your hand at Three-Card Poker or aim for 21 in a round of blackjack. Across from the buffet, you'll find the non-smoking Poker Room, a favorite among visitors.